Safely direct traffic and limit unwanted access all while providing reliable bike parking. These multi-functional bike bollards feature a 2-3/8"O.D. 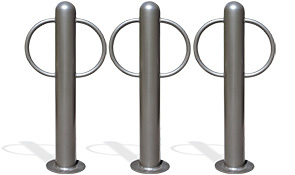 round post and 1-5/16" arm rings, to provide a stable, secure place to park up to 2 bicycles. Engineered ready for high-volume environments, the MIG welded bike rack bollards are finished with an ultra-resilient powder-coating. Configured to accommodate popular installation methods, the convenient Classic Bike Bollards are a fantastic addition for urban and rural streetscapes.